We’re relatively less worried than we were in 2007 and our beliefs split sharply along political lines. According to the latest evidence, Earth is hotter now than it has been in any of our lifetimes but Canadians are less concerned about climate change than they were a decade ago. NASA says the last three years have each been the three hottest on record, and 16 of the 17 warmest years have occurred this century, according to the World Meteorological Organization. This winter, we’ve witnessed Arctic sea ice dwindle to record lows. Yet, climate concern reached its “pinnacle” in Canada — outpacing all other worries, including the economy — around 2007 and has since waned, said Frank Graves, president of EKOS Research. Economic anxieties came back to the fore in the wake of the “Great Recession” and continue to dominate, but that’s not to say climate worries have disappeared. They still rank near the top of the list for most Canadians, although views on the topic vary widely. People in Alberta and Saskatchewan, Graves said, are two to three times more likely than those in the rest of Canada to be skeptical of man-made climate change. But an even bigger division can be found — nationwide — along political lines. 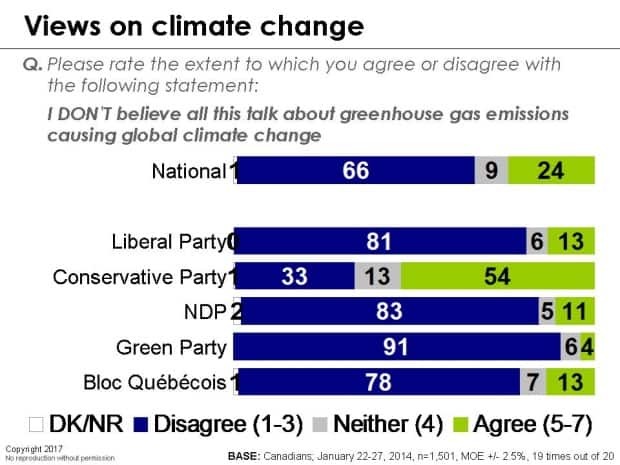 More than half of Conservative supporters have consistently said they “don’t believe all this talk about greenhouse gas emissions causing climate change” in EKOS polling. Outside the Conservative base, only about one in 10 Canadians say the same thing. “(Conservatives) are literally five times as likely to be on what we maybe call politely the enviro-skeptic — or, maybe less politely, the climate-change denier — side of the equation,” Graves said.